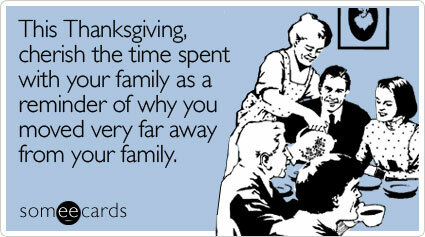 Saw this e-card in referenced in an e-mail newsletter today. I couldn't help but laugh and share the sentiment. My older daughter has had a good transition to grade school and finds joy in learning from a teacher she loves. Both of my daughters find so much joy in being creative. My dog of eight years is still as healthy and happy as ever. I received a promotion that has given me a chance to grow and provide better for my daughters. My department has continued to do so well in getting projects done on time with high quality code. I have public transportation nearby that can get me to work. The DJs of WTTS-FM have helped me keep my sanity, especially Todd Berryman and Brad Holtz. Amazon MP3, for making it so easy to locate and purchase music that I hear on my satellite radio. The Mozilla Foundation, Yahoo, and Google, for providing tools that make web development fun. Web comics like Basic Instructions, xkcd, and Dinosaur Comics, for giving me reasons to smile. For a number of friends, who shall remain anonymous, who have helped put smiles on my face. As I did last year, I took a trip up to the north burbs to visit with my brother and his family. I wasn't all that enthusiastic about going. I can't seem to get past this mental energy barrier that makes the thought of any family gathering extremely painful. It's not that I dislike my relatives, but there are some things about their behavior patterns that make interaction as grating as it is predictable, especially my mother and my aunt. Add to that the continuing cloud of my marital breakdown, and there's not a lot to get excited about. Fortunately, so much of the conversation centered around my cousin's wedding next weekend that some of the old patterns were disrupted for this year. My aunt didn't seem to be as ready to rehash the old stories about my behavior as a two year-old for the umpteenth time. My mom wasn't ranting about how biased the Peacock Network's commentators are against the collegiate football team of Universitas Dominae Nostrae a Lacu and whether they should fire the coach. Still, after everyone had left, my sister-in-law tried to get me to talk about the divorce, wondering where things stood. I gave some basic information... we were still technically married... we'd be filing in the new year... STBX is taking a unit secretary class... we were still civil. She asked me if I had done any dating and whether anyone had tried to fix me up with someone. I told her that I hadn't and that I had intentionally stayed off of the social networks because I am not ready to reconnect with old acquaintances. I'm pretty sure that if I did have a profile, it would show my status as "It's Complicated". Moreover, I don't think I would respond well to one of those retrosexual, "You know, I had a thing for you way back when... but I never said anything about it." I think she's still very curious about why the marriage broke down. I have been very quiet on the events leading up to it. Last year she told me that my mother had speculated about the sexual orientation of STBX, so I can only imagine what sorts of narratives that they have constructed since then. My daughters are staying with me tonight because I have the day off tomorrow, and STBX has to get up early for her class. I'm not sure what we'll do. I've thought about taking them to the light ceremony show downtown tomorrow evening, but it's supposed to be cold and yucky, and for the most part they would be cooped up in my office until it was time for the lights to be switched on, so we might have a movie night instead. Once they are a bit bigger, I'd love to take them to see that show. There has been less tension with my team than there was a few weeks ago. We managed to get commitments worked out for the "clean up" development cycle, and out of that came the fulfillment of all but the dumbest requests. Still, there are times when my employees express concern about where the company is headed. One thing that left the team rankled was that in lieu of our standard company meeting, where there is a recap of goals and how we met them, the President decided to make it a form of a quiz show, with questions created by managers based on things that their departments did for the month of October. My boss has assured me that we as a company will dig deeper into that question at the beginning of the year when we do a strategic planning session. The CEO is very interested in opening up the architecture so that third parties can develop widgets and apps that integrate with the application. The President is fixated on totally revamping the system that is used to adjust the look and feel of content pages. Nov. 17 was an awful day for the systems engineer and I as we had the worst outage that we've ever seen in our collective experiences. He was careless with the management of directories checked out under revision control. Instead of using the appropriate deletion command and committing the change, he used a standard file system command to delete the files. When he updated with the repository, the obsolete files were restored and pushed into production, causing a failure in our caching and bringing the application to a cascading failure. After getting things fixed, we had a long post mortem and worked on some systems and code level changes to keep that component from being a single point of failure. The past couple of weeks have included budgeting meetings, and I have seen some tension between the CEO and the President there as well. The CEO, noting that we are getting a total of a million in funding from a state-sponsored fund, said we should aim for the fences and try to grow aggressively. The President is fixated on the goal of being in the black, which was a goal that we missed in November. I don't know all the details of why we missed that, but I suspect that it was because we hired on some new people in the customer service end of things. At this time, my department will likely get everything I requested, which included big increases for professional development and reference materials. But I've also heard that some departments will get much less than what they requested because they asked for some pretty ungodly increases in their budgets. The President floated an idea suggested by the company's advisory board -- eliminating salary increases for the entire year, replacing it with a company wide collective bonus based on whether the company met its targets, to be awarded at the end of the year. Given that none of the other departments meet their targets, or do so in a way that is laden with asterisks, I wasn't about to buy into this. I told them that moving the goalposts out from under my team when they have been working under a different compensation reward system would most likely motivate them to look for employment elsewhere. On the recruiting front, we interviewed someone on site a couple weeks ago, and decided that there were enough red flags to not extend him an offer. I phone interviewed a couple of others who have proved to be promising, but one of them gave up on the sample code exercise when he couldn't get the software working on his computer. The other submitted a good result, so we will probably bring him in either next week or the week thereafter. Another amusing item from the marketing end of things... Our marketing team decided it wanted to revive dead leads for whom we had offered a price quote. The package essentially offered twice the amount of priced units for the original price quote. All I could think of was some annoying informercial guy screaming, "Check this out! Well give you more of what you didn't want at the price you weren't willing to pay!" Word came to me late last week that upper management was in the process of putting together an offer to a guy for a VP of Ops. According to the President, he was working for another start up in town that was crumbling because of a bad funding plan, and they saw a real opportunity by "scooping him up." Never mind that they bypassed the rest of the company's managers in vetting him through a formal interview process. My guess is that this guy is connected in some sense and had the job handed to him. As someone who had to interview and earn jobs without the convenience of connections, I can't imagine just getting a job handed to me, much less feeling good about getting a job like that. Since this role currently doesn't exist within our organization, it's not clear what the org chart will look like this. I did some Google stalking and found out he was not technical, so I hope he won't have jurisdiction over our department. On a completely unrelated note, I got a promotion from my cell phone carrier for an early upgrade, and being a fan of Do-No-Evil, I am falling prey to the siren song of getting a Droid.